The San Jose Blog: Fourth of July Festivities! Today there are two great 4th of July events happening in San Jose tomorrow. 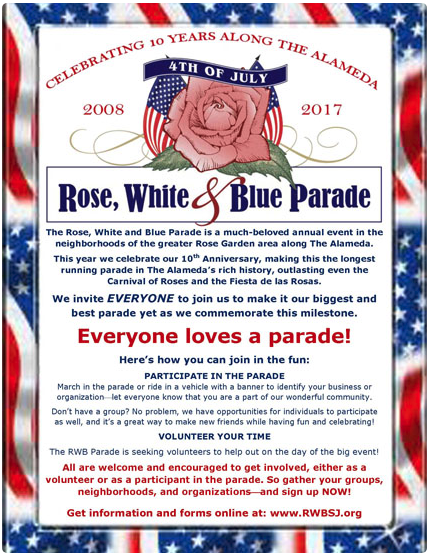 The first is the 10th anniversary of the Rose, White & Blue Parade. The Parade starts at the Lincoln High School parking lot at 10am and continues 1.6 miles all the way to The Alameda. At the end of parade is a festival with arts and craft booths, entertainment, food, craft beer, and antique cars. This year, there is even a family-friendly group bike ride immediately after the parade. For more info head over to the Rose, White & Blue Parade website. 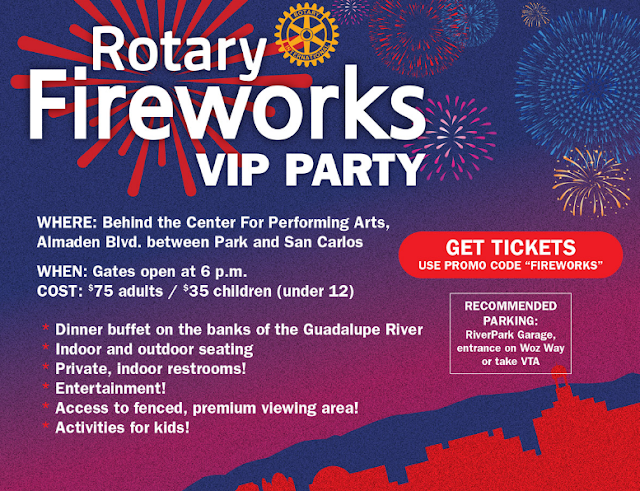 The next event is the Rotary Fireworks show which is free and can be seen from most of Downtown San Jose. They also have a VIP Party behind the Center for Performing Arts that includes a dinenr buffet in front of the Guadalupe River, indoor restrooms, entertainment, and a premium viewing area. Tickets are $75 for adults and $35 for children. More info and ticket purchasing is available over here.